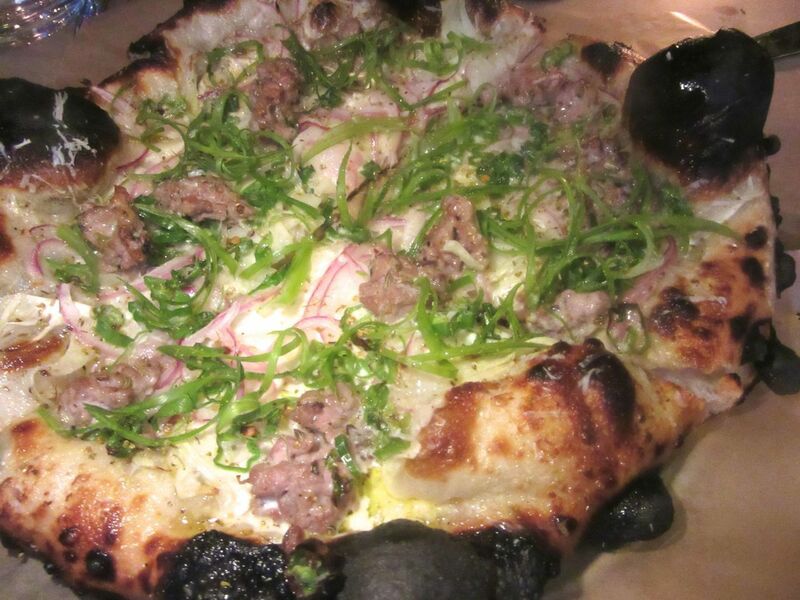 The chef’s dough is especially flavorful, the sausage pie with cream is blistered and charred. It’s only the second night at L’Amico. Laurent Tourondel has been secretly prepping for this September launch most of the summer, hiding from passersby on Sixth Avenue behind thick, brown velvet drapes. All summer, his unique charred and blistered pizzas and the singed, lemon-infused chicken emerging from L’Amico’s duo of wood-burning ovens got rushed out back to his unpublicized wine bar, The Vine. It was a research project friends and I spied walking by on 29th Street one July evening that drew me back again and again. Click here to read: Laurent Tourondel, You Can’t Hide From Me. We caught the chef at ease in L’Amico’s open kitchen when there was a lull in demand at The Vine. Now it’s officially fall. 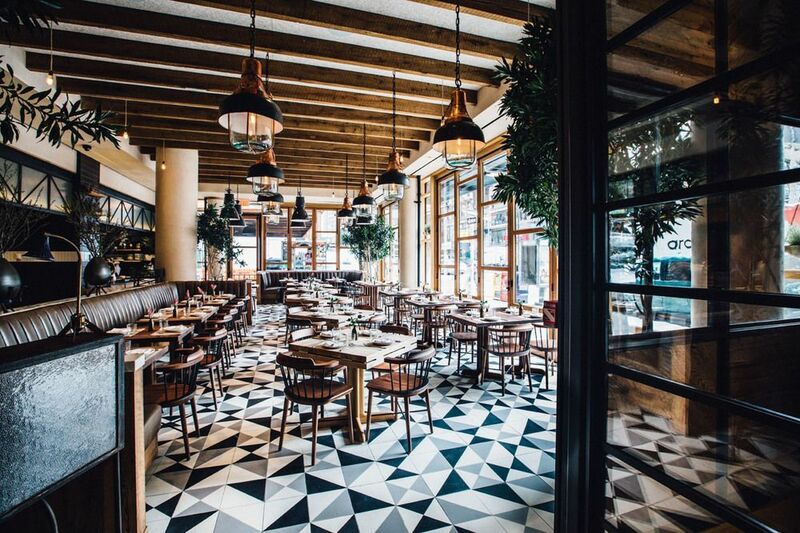 Laurent and his chef de cuisine, Amy Eubanks, lunge around L’Amico’s open kitchen like athletes grabbing a ball for the jump shot, as a mix of aggressive civilians, Eventi hotel guests and celebrity first-responders, claim wooden tables with butcher paper mats and unpadded Windsor chairs. It could be just another hotel coffee shop, except for the Gallic royalty in the kitchen and the crazy quilt chiaroscuro of the cement tile floor. “Something they did in Italy in 1900,” Tourondel notes. Don’t try to find a pattern in the cement tile floor. Classically in Italy there wouldn’t be one. Tourondel has wanted to do an Italian restaurant for years, even though he remembers his very snobby French father complaining whenever the family was obliged to eat at his Italian mother-in-law’s table. Why not? This is the year when Midwesterner Michael White expanded his mostly Italianesque empire with a more or less French menu at Vaucluse. There is opera on the sound system. And Italian liqueurs and bitters flavor the late summer cocktails curated by Yana Volfson and Katie Stipe. I’m torn between spicy Esposito sausage pizza and the white mushroom pie with fontina and taleggio. 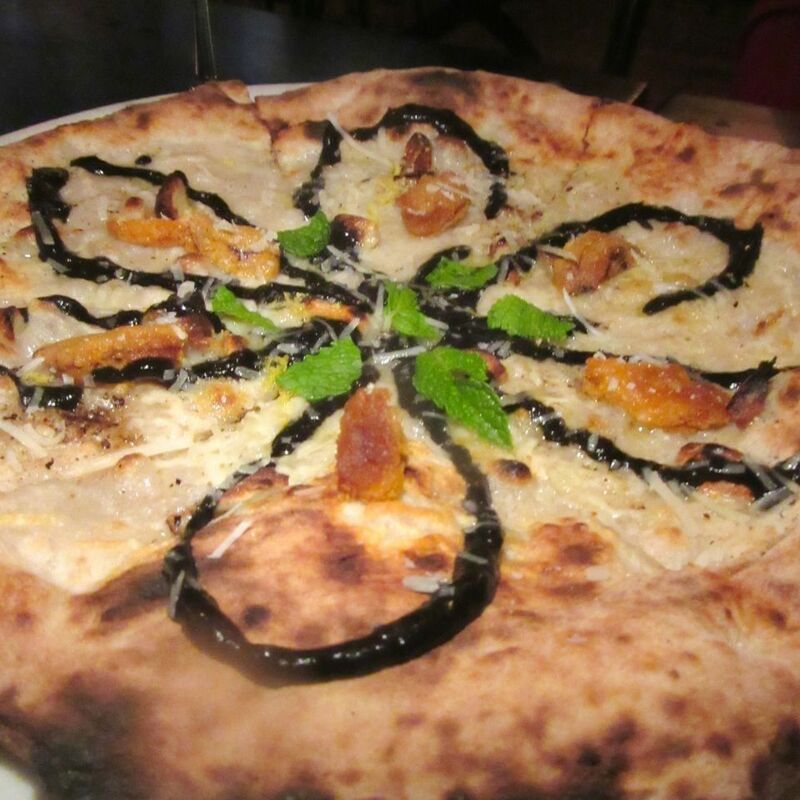 Tonight, four of us are sharing the Esposito sausage pizza with cream and shishitos – that dramatically in-your-face blackened pie with its boldly-flavored dough. “It tastes just like the fried dough my Nanie made for me every morning,” marvels one of my sidekicks. Our foursome has no problem dividing three meatballs. It’s the garlic foccacia I can’t get enough of. The veal and pork meatballs in a froth of tomato sauce are back. A trio. I remember thinking, what a torture, why not four? Not that we are the kind of people who stab each other over half a meatball. 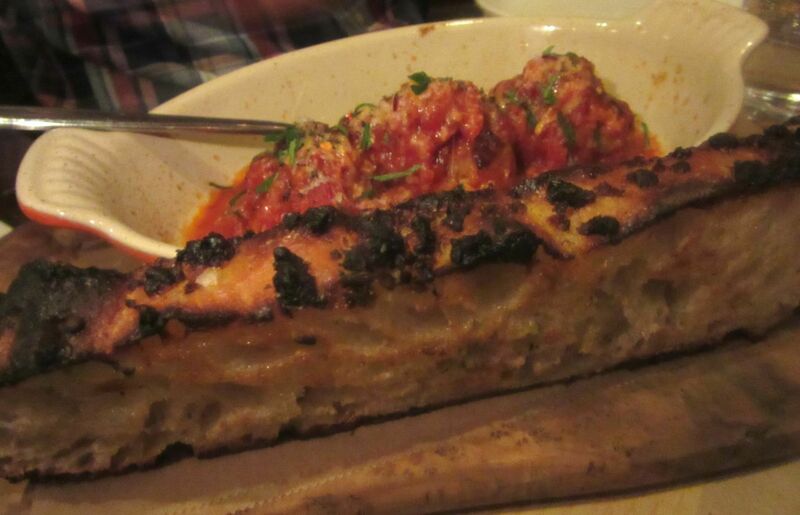 Now there is a plank of marvelous garlic bread alongside -- “garlic-parsley focaccia,” says the menu. I take a bite and gasp. It could be the most thrilling bite of the evening. There’s just enough mache on the avocado salad to fool us into thinking we’ve eaten vegetables. 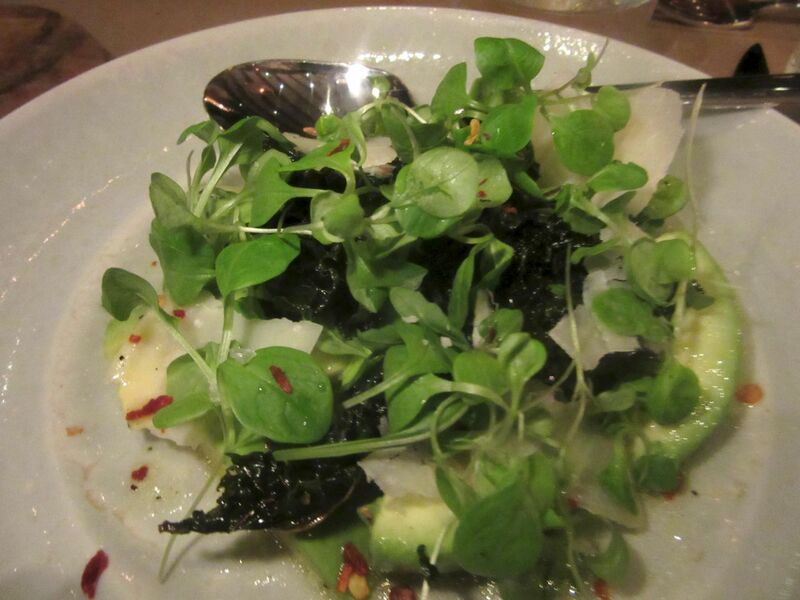 The $10 toss of mâche, charred kale and avocado in lemon oil is a token bow to healthful greenery. As a committed kale debunker, I can’t help observing that charring the inedible green actually makes it break up into not disagreeable little wisps in my mouth. We are dividing everything -- the chef’s gift agnolotti with seafood and the pipe rigate we ordered. The little rigatoni curls are not as dauntingly rich as they were this summer when there was pork as well as veal shoulder in the Bolognese. 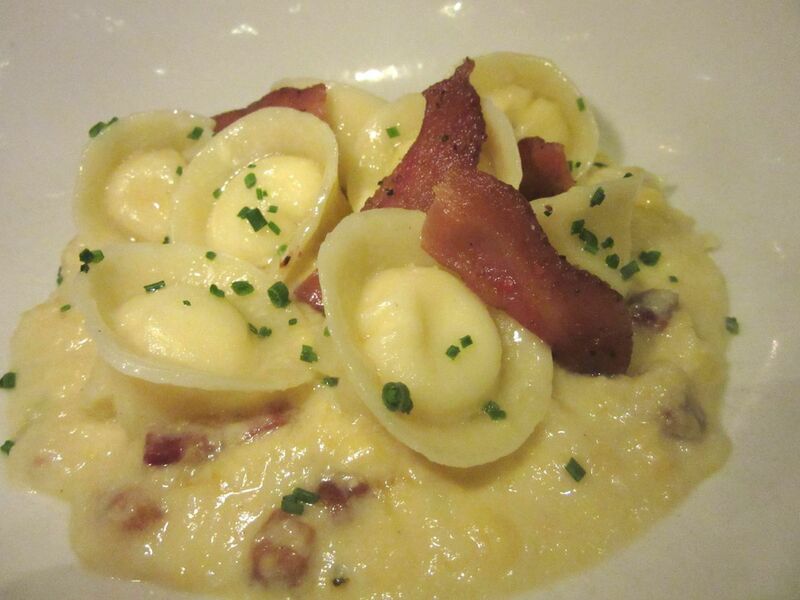 Fontina-filled cappelletti with corn and lardons of guanciale is a new pasta at L’Amico. Exquisitely delicate cappelletti (from the monster pasta extruder in the cellar) are new tonight, stuffed with fontina and deliciously dotted with corn and lardons of guanciale. Fat and salt. The Nureyev and Fonteyn of Italian cooks. 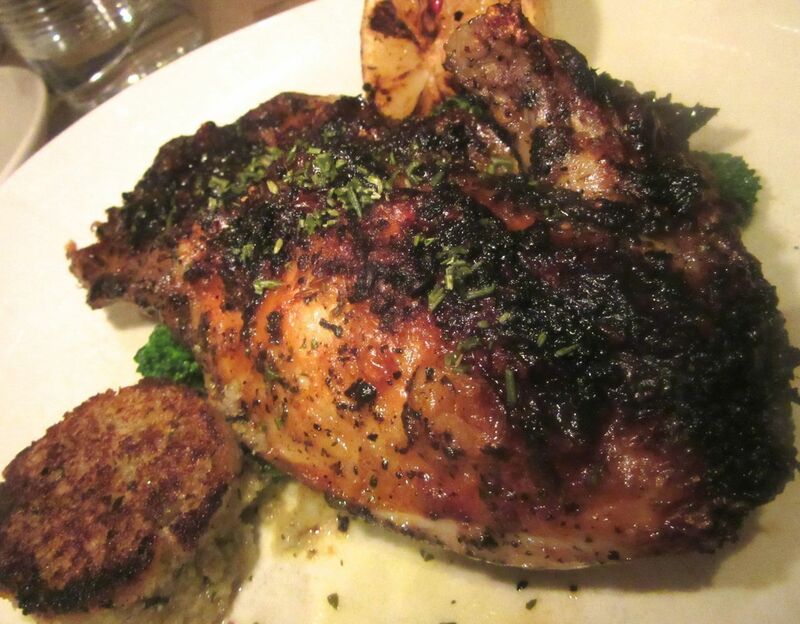 Half a lemon chicken from the wood oven is so rich, it’s enough for four of us to share. 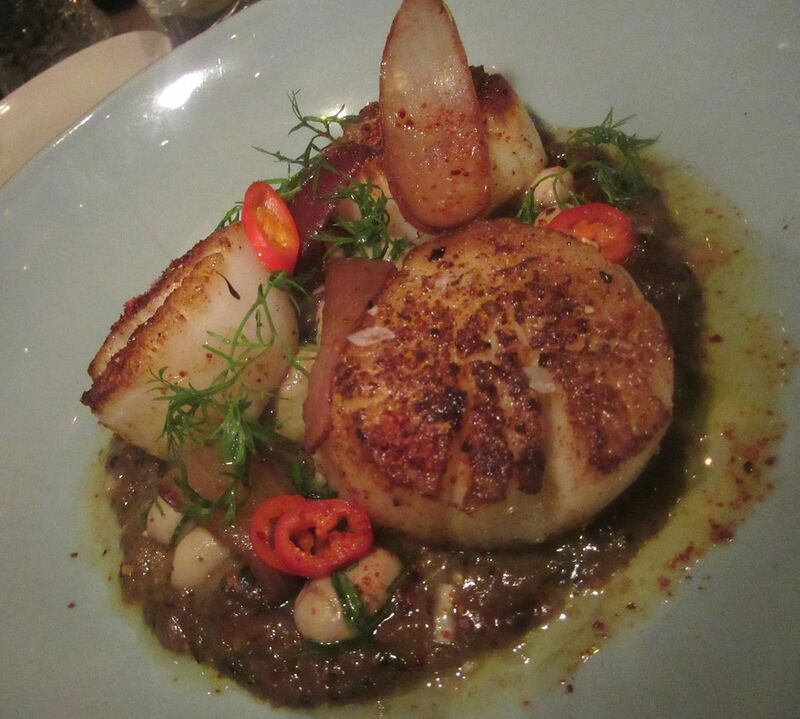 The chef’s gift scallops are glazed in the oven, then served with cranberry beans and eggplant puree. 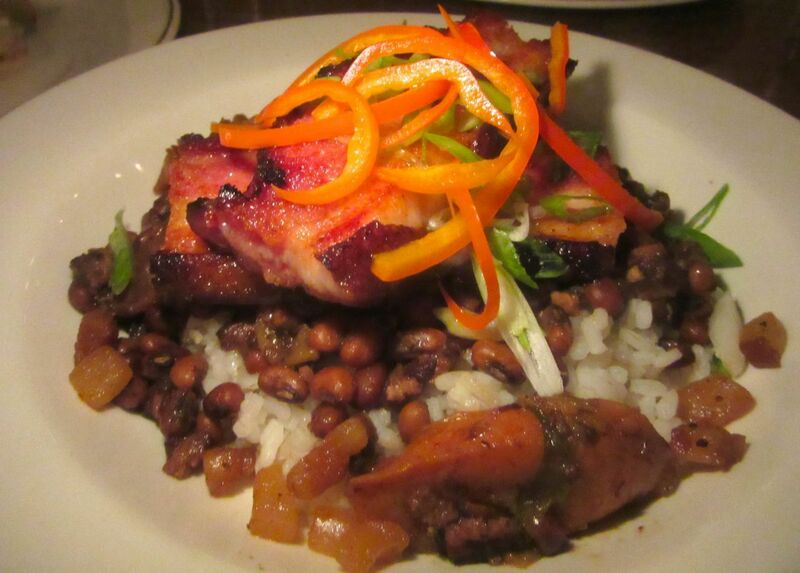 Even if the chef is not targeting your table for extras, it’s easy to order too much here. Many plates and bowls are small. Prices seem gentle. Burrata with romesco and arugula. Yellowtail crudo with grated lime and orange confit. Roasted figs and robiola cheese in a puddle of reduced port. One last gasp of heirloom tomato with watermelon and ricotta salata before someone pulls the plug on great tomatoes. 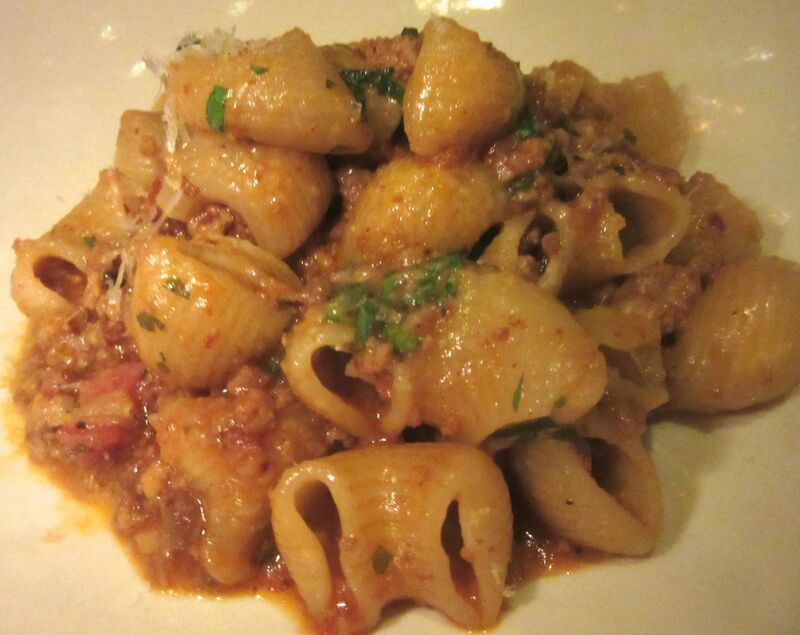 The Bolognese, so shockingly rich with pork and veal, is tamer now with veal shoulder alone. How to choose? You absolutely must have a pizza -- mushroom with fontina and taleggio is my first choice -- but then you want to try crostini too. Maybe peekytoe crab with avocado and peas; it can be divided in four heaping small cuts. 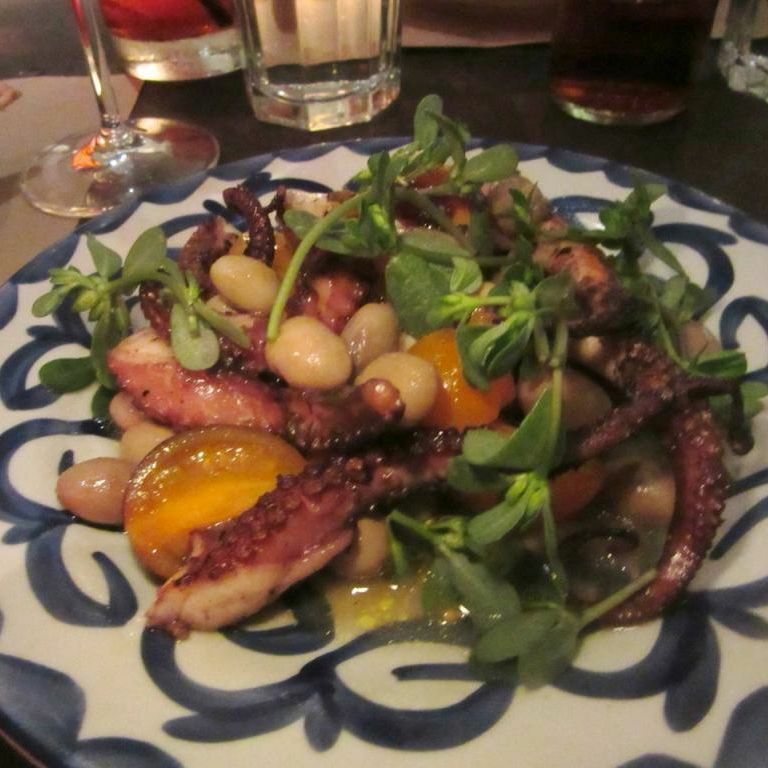 Yes, you want to explore Tourondel’s pastas. On a second visit, my friend and I fall for house-made fusilli with spicy sausage, bitter greens, chiles and pecorino. So good, she must take home the leftovers. 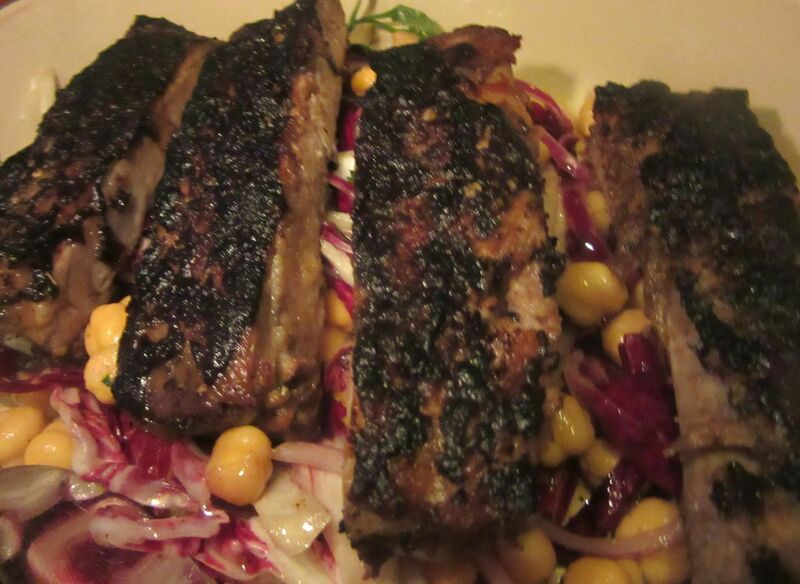 Properly chewy ribs (the way I like them) were a new addition at L’Amico last week. Perhaps everyone at your table will insist on their own main course. There are only five, $22 to $28. Six if you count tonight’s special, properly chewy ribs. Why would you resist skirt steak with Calabrian chile, chopped almonds and charred cauliflower, from the chef who created BLT Steak? Plus, if you’re like us, an extra side of charred cauliflower won’t be redundant -- the wood-fired veggie is just so good. 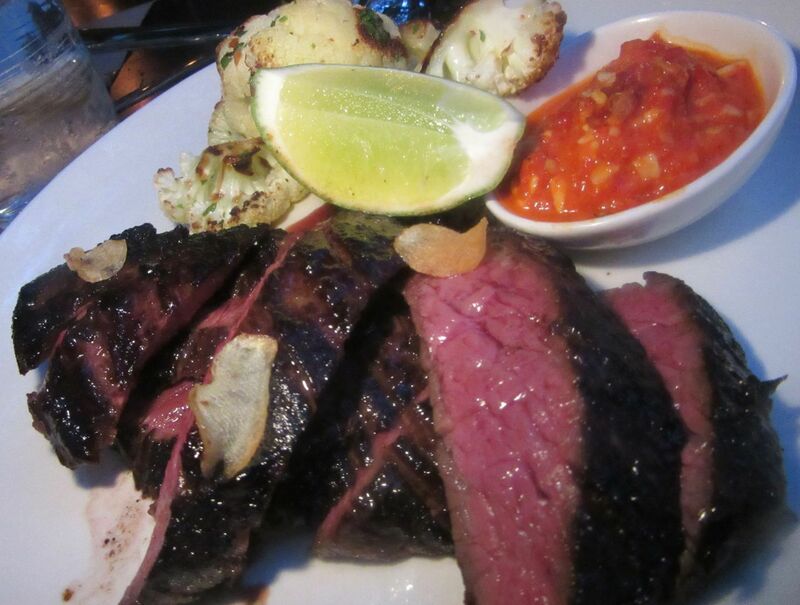 The skirt steak with charred cauliflower is excellent though it was thicker and rarer at The Vine. I’m building up to the assumption that you’ll decide you have no room for dessert. That would be foolish. Force yourself to reconsider, if only to share a duo of the chef’s sensational ice cream inventions – two flavors, churned to order and delivered at the perfect temperature, already starting to melt as they dance to your table in metal goblets wearing a just-baked pastry headdress. Pistachio-orange marmalade, black cherry amaretto, chocolate gianduja or, for the moment, Long Island corn. Grab a small, classic ice cream shovel, like the goblets, imported from Italy, and catch the drip fast. 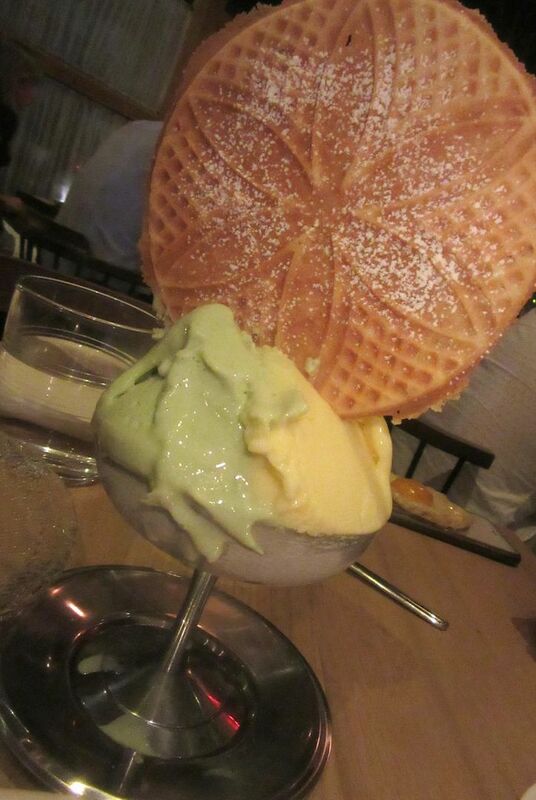 I am crediting Laurent with perfecting a new ice cream excitement though he says he saw it in Milan. If you and your posse are fervent dessert freaks, you’ll want to taste the crunchy chocolate-hazelnut-caramel budino, too. 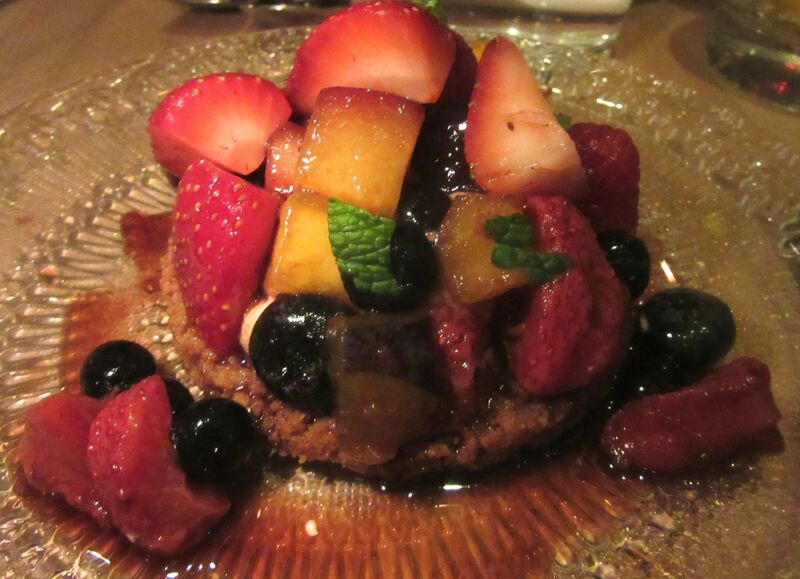 And definitely the generous toss of summer fruits piled on honey crackers, or lemon ricotta gelato on watermelon with berries and stone fruit, grapefruit (or lime) and honey. 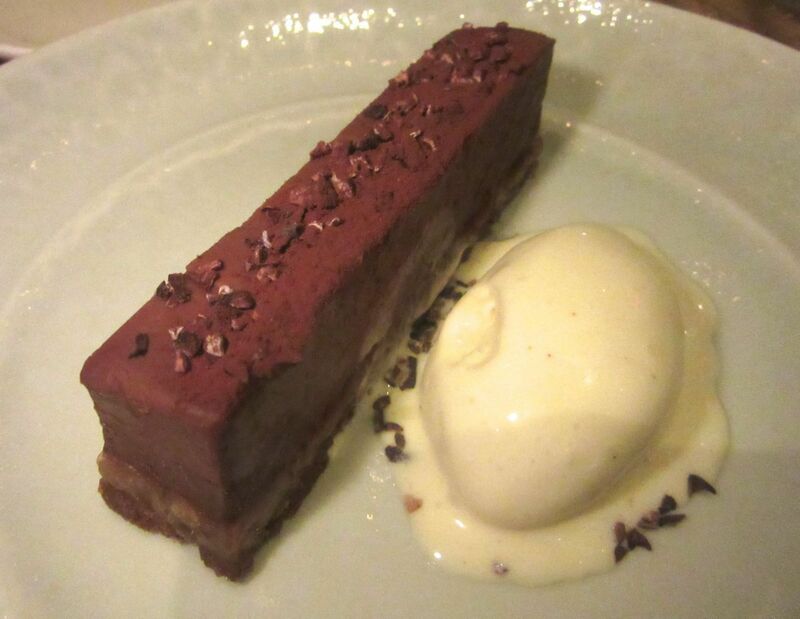 Pastry chef Xavier Goiz does a mean hazelnut caramel chocolate budino with cinnamon milk gelato. That’s what my friends and I were eating all summer out back at The Vine, outdoors on the small terrace when it wasn’t raining or too humid. That made it tough at new places I scouted. I would taste and think, this is nothing much compared to The Vine. On Saturdays, when the toot tattle of New York fled to the country, I’d come with a similarly guest-roomless friend. We might be one of only two or three occupied tables. It takes dedication to deliver summer fruits like this because they fade so quickly. 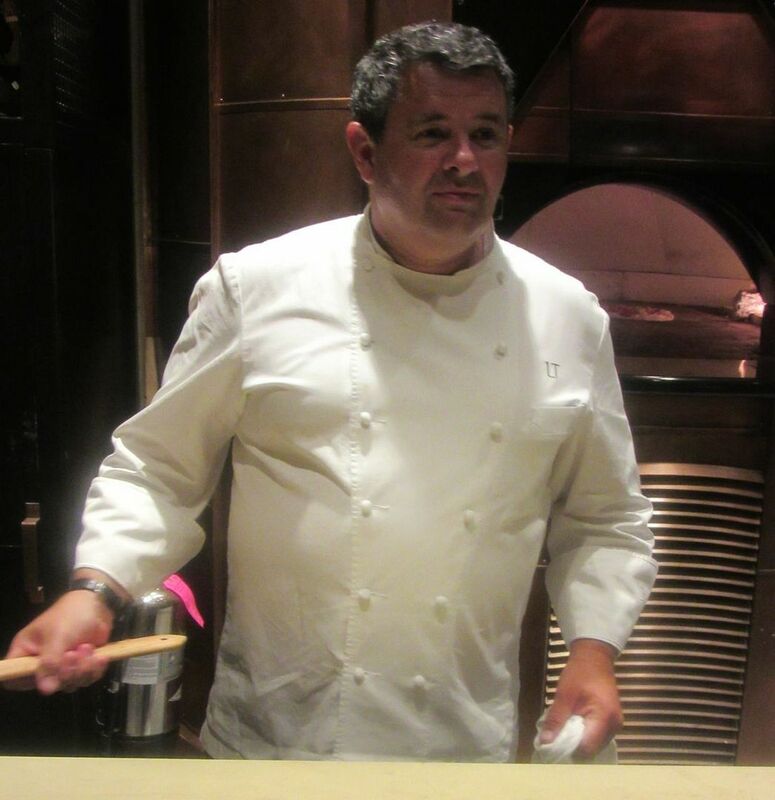 That first evening, Laurent appeared at our table and invited us to visit the kitchen in the shrouded L’Amico. 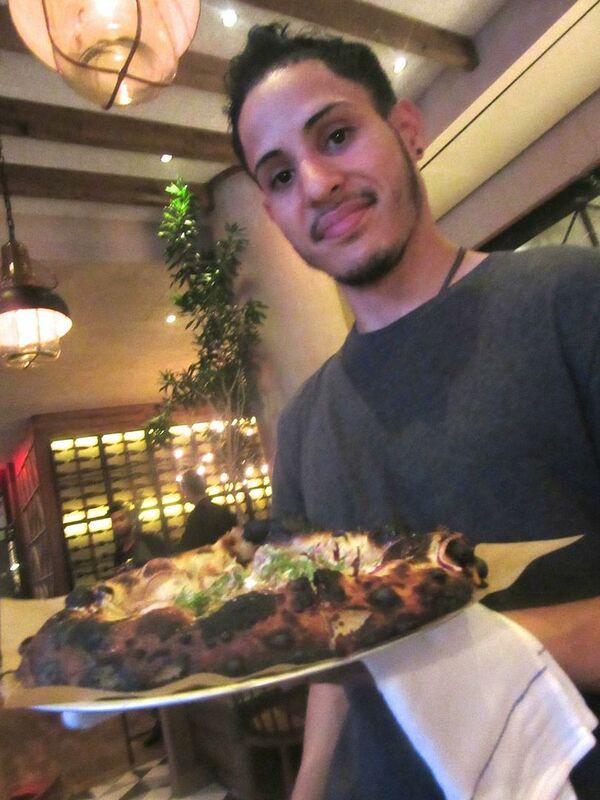 He explained that he was developing a menu for the new place at The Vine. He planned to get listed in fall lineups by waiting to open L’Amico post-Labor Day, after a huge bash benefitting Citymeals-on-Wheels. (That’s a confession of course.) Once the new place hits its stride, The Vine will stop taking reservations and he plans to edit the menu. The burger will only be served out back, he has said. He’ll save osso buco for the front room come winter. 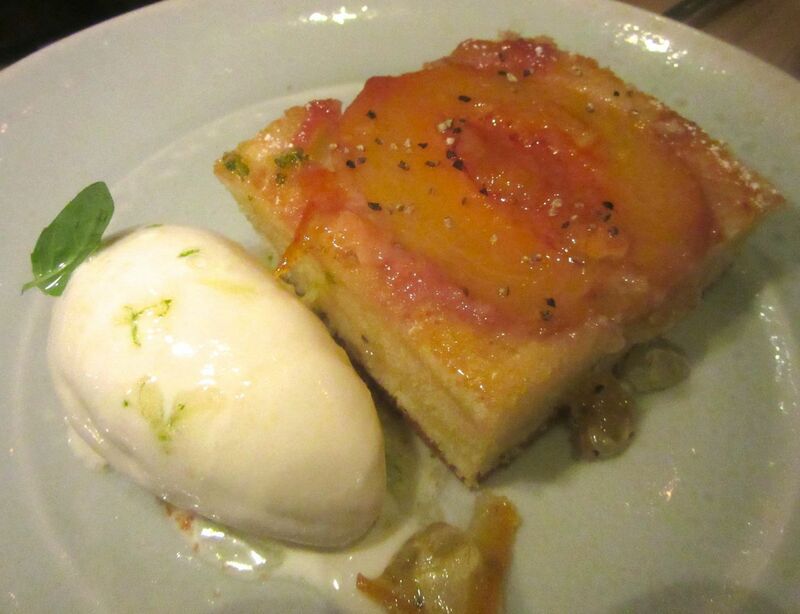 Don’t think you have had enough desserts until you at least taste this almond paste cake with peach. The Eventi Hotel in Chelsea may not be on your GPS as the perfect place to stash out-of-town friends, but with Lupulo, George Mendes’ stellar Portuguese taverna on the corner of 29th Street, and Tourondel cutting loose adjacent to the lobby and in the wine bar, the hotel should soon be a magnetic corridor of sublime eats. New “art” keeps arriving in The Vine and sometimes lands in the W.C.
By the way, it’s a daunting trek to the bathroom, a dazzle of antiqued mirror with a unisex hand-washing trough that L’Amico shares with The Vine. But go. 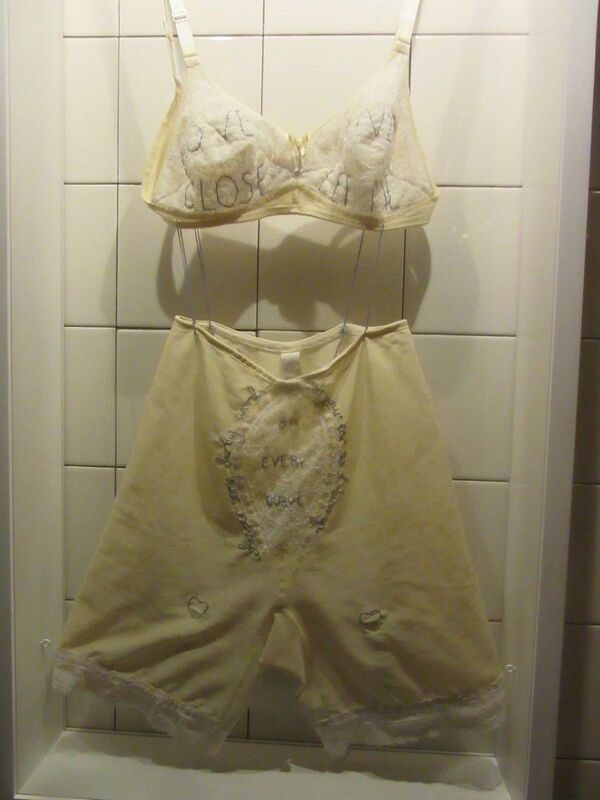 That gives you a chance to consider the amusing accessories by Kyle DeWoody – a plaster nose, a smiling flower pot and on the WC wall, a framed peach-colored girdle and bra from the ‘50s embroidered: “Move close and let me whisper some dirty words in your ear as I kiss ya on every curve.” On Saturday night, I recognized the recorded welcome of “Nights in White Satin,” in Italian. 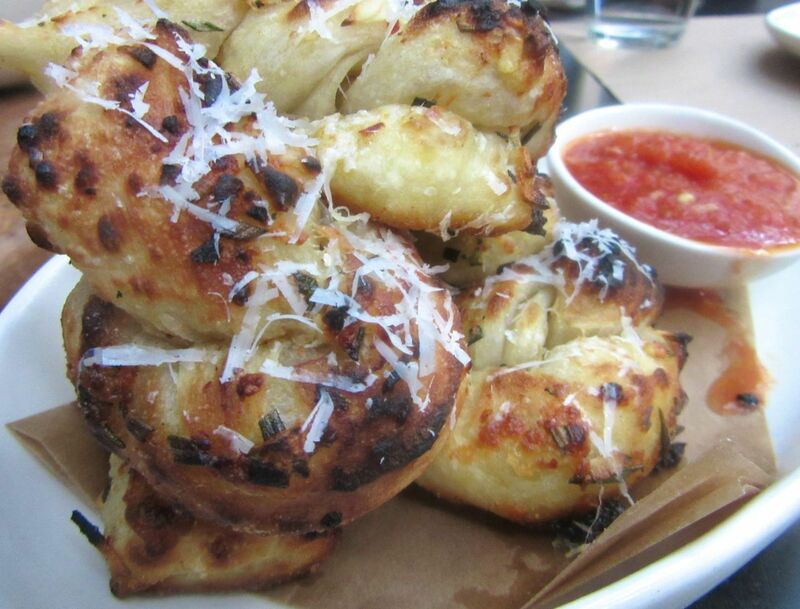 The chef hoped he could bake these luscious garlic knots to order as an amuse but it proved impossible. 849 Sixth Avenue between 29th and 30th streets. 212 201 4065. Lunch Monday to Friday 11:30 am to 2:30 pm. Saturday and Sunday brunch 11:30 am to 3:30 pm. Dinner Monday to Sunday 5:30 to 11 pm. Late night in The Vine. Food till midnight. Drinks till 1 am.